Pages: pp. 128, 189 Illus. 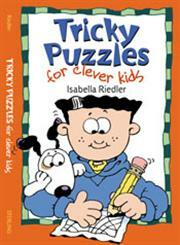 The Title "Tricky Puzzles for Clever Kids" is written by Isabella Riedler . This book was published in the year 2. The ISBN number 0806967536|9780806967530 is assigned to the Paperback version of this title. The publisher of this title is Sterling Publishing Company Inc.. We have about 5724 other great books from this publisher. Tricky Puzzles for Clever Kids is currently Available with us.